Following the success of last year, the StockMKT is hoping to repeat itself again this year with another pop up night market in the middle of Bermondsey square on 28th April. When I got wind of this, I immediately crossed everything out of my diary and headed down to Bermondsey. I was that excited that I found myself arrived way too early and all the traders were still setting up their stalls. But very soon, it all started to get going with the local Bouther Primary School choir singing an arrays of songs. 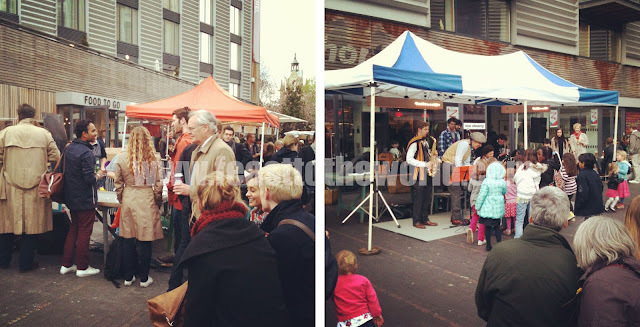 The night market put together a strong collective of art, jewellery and fashion traders etc. But what really attracted my attention were all the street food vendors and what an impressive selections on the night. There were the Pizza Pilgrims, who usually based in Soho Berwick Street market who serves some pretty mean pizzas; and then there were the almighty Abiye's Big Apple Hot Dogs; James Ramsden new venture - Kebab Kitchen ; Bhangra Burger and many more. I came prepared by starving myself silly throughout the day to be able to eat as much as I can. 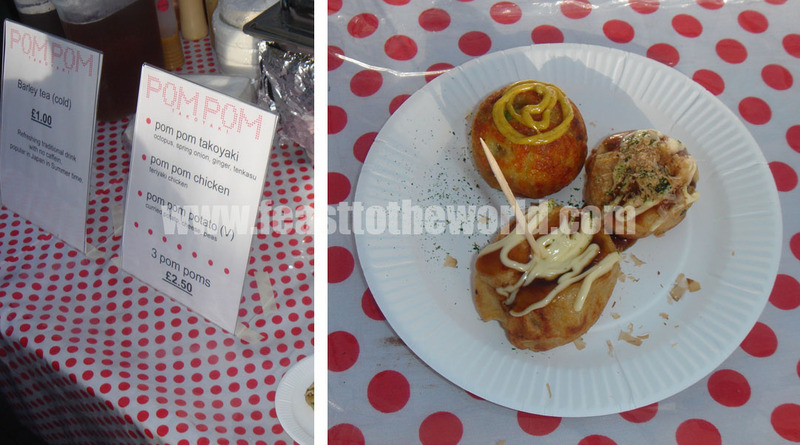 I zoomed in on the newly established Pom Pom Takoyaki by two lovely Japanese girls, Hana and Tamo. I learnt about them through the medium of twitter and had been dying to get my paws on those delectable octopus balls and I wasn't disappointed. In addition to the classic octopus combination, they also offered chicken mayonnaise and curried potatoes version - their reinvention of the classic. Light and truly flavoursome, they were all delicious and it was hard for me to pick out a favourite, so much so that I went back for a second helping of all three toward the end of my stay at the market just to be sure. I am predicting great things from these girls. Next on the firing line was the fantastic Egg Boss. Sean's inventive scotch eggs have been gaining quite a reputation lately and after a series failed attempts to head down to Brockley Market, I was glad that he was present on the night. It was great to see his brilliant sense of humour as his pictures. He posed when visitors took pictures of the stall. 'Look at these eggs! That's why they called me the boss!' he chuckled. The Big Apple Hot Dogs served what I think is the best quality hot dog rolls around. I have tried the Big Dog from their usual Old Street stalls and decided to go for the Big Frank this time round. Most of you who have read my past review of this brilliant hot dog joint would have noted how disappointed I was not being able to meet the man behind all this but this had been rectified as Abiye himself was here on the night and I was able to have a quick chat and what a privilege it was. And as for the Big Frank, it was beautifully seasoned and the pork was meaty and firm with light smokey flavour, miles better than any hotdog rolls that I've ever had, beside the Big Dog that is. For those who always think that all hot dogs comes from a jar should really ought to pay the BAHD a visit just to see what a true hot dog is. Bea's of Bloomsbury, with their amazing displays of beautiful baked goods were also another stall that I had the fortune of sampling. Bea herself were manning the deep-fried brownies which although I was tempted, was eventually too faint-hearted to go for. 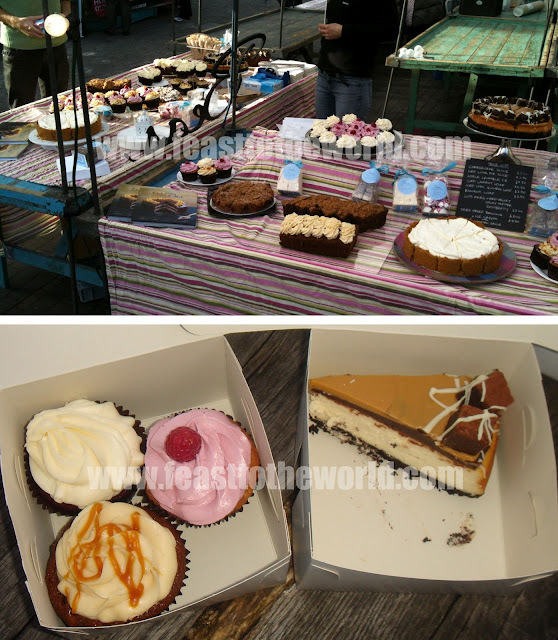 Although I did bought all three different cupcakes - red velvet, sticky toffee and raspberry - and a slice of the very naughty fudge and chocolate brownie cheese cake. The cheese cake were creamy and just sweet enough with the doughy brownies and the chewy toffee, offered an all balanced texture. It might be sinful, but it was also delicious! The cupcakes were light and fluffy and had a creamy and rich toppings which were just divine. I had initially bought then to keep for breakfast the following day but none of them survived the night. They were just too moreish. 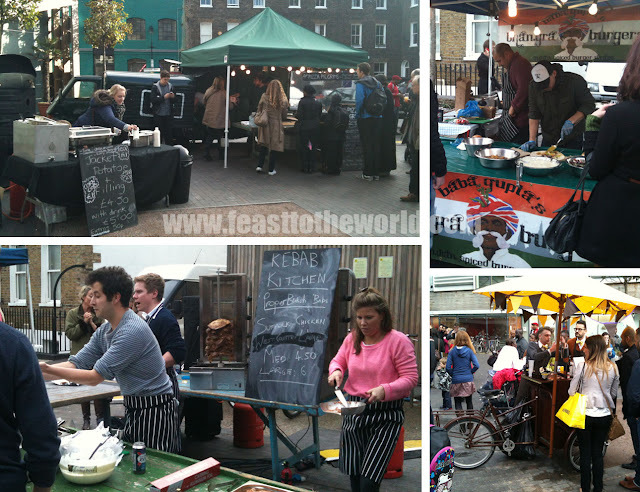 There were many more street food delights that I had wanted to try at the StockMKT but I will save them for next time. It was a fantastic night and the atmosphere were just amazing. There were live music throughout the night and it was constantly buzzing with people. What a brilliant event and a massive well done to the organiser of this pop up night market. 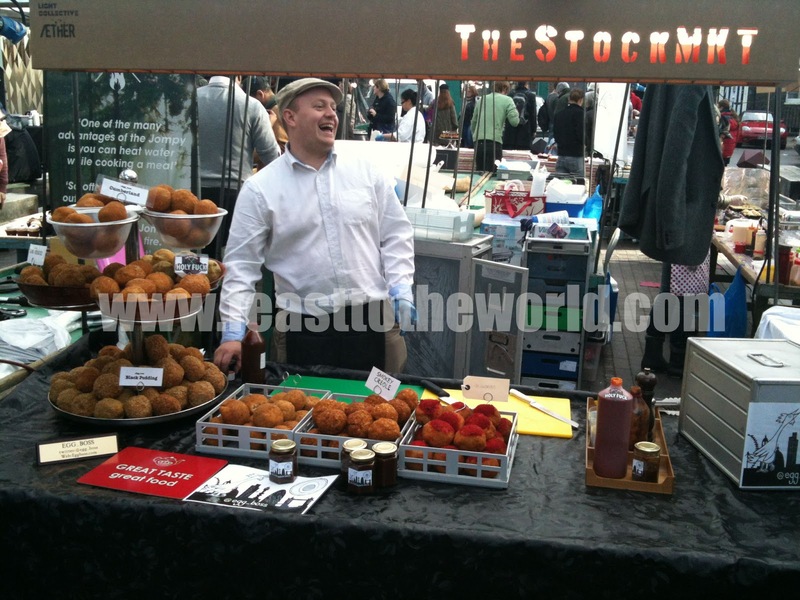 For more information on upcoming pop up from The StockMKT, visit their website by clicking on the link or follow their progress on twitter @TheStockMKT.